Saratoga Street, just past Brooks, this morning. From this 311 complaint. More than a year ago, state transportation planners showed off their plans to ease congestion at the entrance to the Sumner Tunnel after the toll plaza was removed, and promised residents would soon see relief. Whatever they did, didn't work, residents say. Read more. Do you know what it takes to park a train? To create a place to park a train? Are you aware of the almost trivial simplicity of this task? Well, the MassDOT is quite aware that the public (including elected officials) have no clue, and are thus ripe for the type of manipulation which they (and other public transit agencies) have perfected over the last few decades. Tuesday’s meeting hosted by WalkBoston and the Charles River Conservancy about how MassDOT’s reconstruction of the Mass Pike in Allston can Unchoke the Charles River Throat brought out 150 people and a renewed emphasis on the need for the project to prioritize removing barriers, creating connections and healthy transportation. Read more. 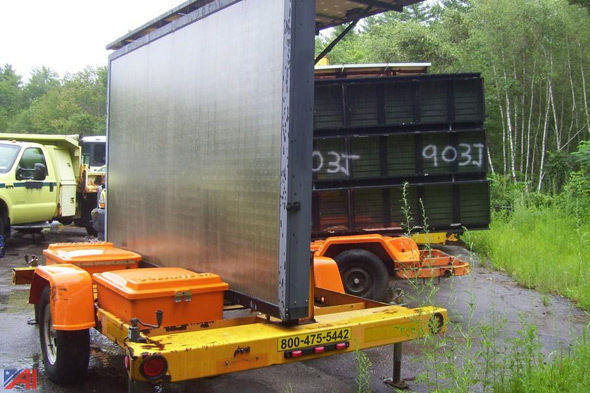 MassDOT and the freight railroad CSX are battling the owner of a vacant parcel next to a currently dormant rail line behind the South Boston convention center over his proposal to lease out the space for construction companies to park their trucks there. Read more. 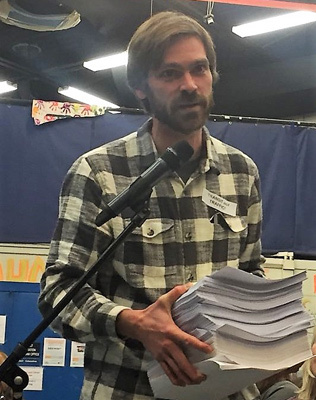 Galen Mook with three years of meeting minutes - "make this not just a highway project"
Support for better bus and rail transit dominated last night's meeting hosted by MassDOT on the Mass Pike Allston reconstruction project. State transportation officials tonight detailed their latest plans to ease the traffic woes that have beset East Boston since the Sumner Tunnel toll plaza came down in May and was replaced by a new configuration of roadways, but skeptical residents were having none of it. Read more. Two MassDOT workers at the Zipper Lane building on the Expressway have been placed on leave while State Police investigate whether that was a real pot plant they had in a window there, WCVB reports. State Rep. Adrian Madaro (D-East Boston) is pissed off at the way his neighborhood's roads have become gridlocked after MassDOT removed the Sumner Tunnel toll plaza and modified the approaches to it a couple weeks ago. In a letter to state Transportation Secretary Stephanie Pollack, he writes that rather than the "safer, smoother and more efficient commute" promised by MassDOT: Read more. What would you do with an electronic roadside message board? For sale: One gently used, solar-powered message board of the type some rapscallion would no doubt use to mess with drivers' minds, but you would never in a million years think of abusing. Read more. 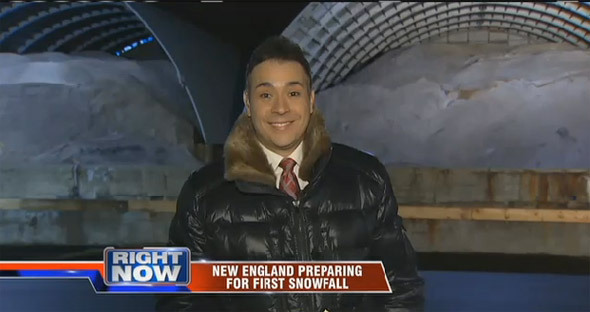 Reporting live from a salt pile in Weston. Channels 7 and 25 began exclusive reporting from a MassDOT salt pile in Weston yesterday evening, more than 30 hours before the anticipated arrival of what Channel 25 tells us "won't be a winter wallop." Exhausted evening reporters who reassured us the state had plenty of salt were replaced this morning by fresh reporters, who reassured us the salt pile had not disappeared overnight and was ready to be put to use in the first winter storm of the season. Read more. MassDOT and the MBTA today withdrew impending changes to the schedules of North Station commuter-rail line, saying they will come up with new proposed schedules next month to go into effect this spring - after public comment. Read more. Residents left a planning meeting to improve South Boston bus services Wednesday night frustrated by bus stop changes the T developed without first asking the public for insight into major issues in the area. Read more. The Globe reports state officials are working on a plan to empty the Transportation Building in Park Square and build a new transportation complex as part of the Tremont Crossing mixed-use development across the street from Boston Police headquarters on Tremont Street. The move would jump start that project and free up the Park Square building for redevelopment. The BRA has a vaguely worded item related to the proposal on its agenda for this afternoon's board meeting, which starts at 5:30 p.m. in its ninth-floor hearing room in City Hall. I actually just spoke to a Cust Svc rep at @MassGov who said they're aware of it but doing nothing. Somerville, MA, July 29, 2014 – While pleased the grounding of the McGrath highway is moving forward, residents and local elected officials who attended a recent meeting told Massachusetts Department of Transportation (MassDOT) representatives that they want to make sure everyone is kept updated on planning and construction, and that the project is well-coordinated with other work going on around the city. “As things change on McGrath, how will that effect Union Square, and the study that’s going on right now in Union Square?” Ward 2 Alderman Maryann Heuston asked at the July 17 meeting. At a public meeting, MassDOT released some opinions on the McGrath Highway. MassDOT has recommended that the McCarthy Overpass portion of McGrath Highway be grounded and the roadway developed into a Boulevard that reconnects East Somerville, Union Square and Brickbottom. A Forest Hills bridge is a connector, not a barrier, because it keeps 24,000 vehicles per day that are not going to local destinations off local streets. With the bridge, the traffic volumes on New Washington Street are kept relatively low, about one-third of what traffic volumes would be without a bridge. Channel 5 tweets that MBTA General Manager Rich Davey will replace state Transportation Department Secretary Jeff Mullan next month. As head of MassDOT, Davey will assume responsibility for highways across the state, including the turnpike and the ever popular Big Dig. In addition to announcing more delays in the Green Line extension, the state Department of Transportation wants to make sure the dormant proposal to extend the Blue Line to Charles/MGH stays dead. In a filing with state environmental officials, MassDOT says spending another $49 million to study finishing what is now a $748 million project it has no intentions to build is pretty damn stupid, so it wants to be released from any obligations to do more studies.